The camp is $225 per week, Monday-Friday. The camp is for kids of ages 8 -14. The camp begins each day at 9 am and ends at 5 pm. The drop off time for the kids is between 7:30 am- 8:30 am. Pickup time is between 5:30 pm-6:00 pm. Each child that is registered receives a t-shirt and a nylon backpack. If you are interested in registering for the summer day camp and have any questions, please contact us at 334-271-2402 or 334-220-3581. You can also contact us by email at thegrandmahomehouseretreat@gmail.com. Who loves fishing? Come discover the many types of game fish in our huge 3-acre lake. The morning will begin with learning about the different types of animals submerged in our lake. For example, big mouth bass, bluegill fish, minnows, turtles, frogs, tadpoles, and genetically engineered grass carps! After our learning session, we will put our knowledge to work by fishing and exploring the Grandma Home House Retreat grounds. Add some excitement to your summer by learning all about horses! You will learn about different types of horses, how to groom and take care of horses, how to saddle up a horse, and even have a chance to ride if you’re a true Cowboy or Cowgirl! Our trailblazing day will begin with learning about safety when riding bikes. We will discuss the importance of riding with helmets and at the end of the day ride bikes throughout Grandma Home House Retreat! Calling all paddle boat and canoe riders! On this day we will have our lifeguards instruct about water safety. 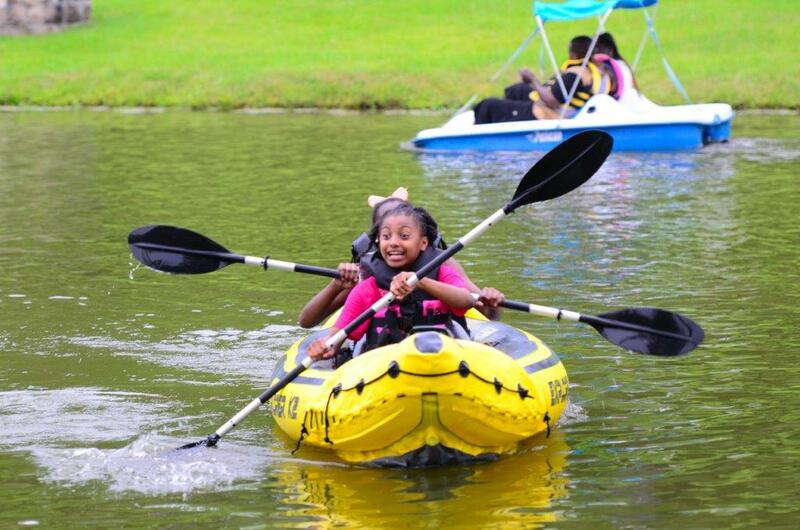 Giving the do’s and don’ts of things to do while using paddle boats and canoes. The evening will include actual canoe, and paddle boat rides for those who chose to do so. This will be a complete day of fun where kids will play on giant water slides and other game activities. Kids will love our WET N WILD obstacle course where they can compete against their fellow campers. Note for parents: Please know that on all days we will have many optional things that kids can do if they chose not to participate in our theme day activities. For example, kids will have access to the basketball and volleyball courts. Please visit our website to learn more about the different animals and insects at Grandma Home House Retreat!